2013 100th Indian Science Congress venue location details, 100th Indian Science Congress Kolkata starting ending date schedule timings, 100th Indian Science Congress Kolkata features facilities, 100th Indian Science Congress Kolkata entry ticket price, about 100th Indian Science Congress Kolkata 2013. 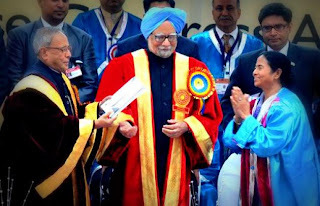 100th Indian Science Congress in Kolkata has been inaugurated by Honourable President of India Sri Pranab Mukherjee on 3rd January 2013 at Salt Lake Stadium (Yuva Bharati Krirangan, Kolkata) in the presence of Honourable Prime Minister of India Dr. Manmohan Singh, Governor of West Bengal Sri M.K. Narayanan, Honourable Chief Minister of West Bengal Ms. Mamata Banerjee, Shri Jaipal Reddy (Honourable Minister of Science & Technology & Earth Sciences, Govt. of India), Shri Kapil Sibal [Honourable Minister for Communication & Information Technology, Govt. of India] & many other renowned personalities of India & West Bengal. Let’s check out the 100th Indian Science Congress Kolkata 2013 details like schedule of 100th Indian Science Congress, venue of 100th Indian Science Congress, entry timings of 100th Indian Science Congress etc. • 100th Indian Science Congress Kolkata Date Schedule: - The 100th Session of Indian Science Congress event started on 3rd January 2013 and will end on 7th January 2013. • 100th Indian Science Congress Kolkata 2013 Venue & Location address: - The programs of 100th Indian Science Congress will took place at various locations in Kolkata and they are – Salt Lake Stadium, S.N. Bose National Centre for Basic Sciences (Salt Lake), Saha Institute of Nuclear Physics (Kolkata), Calcutta University Sale Lake campus, Bose Institute (Kolkata) and National Institute for Cholera & Enteric Diseases (Kolkata). • 100th Indian Science Congress Kolkata 2013 Organizer details: - The Indian Science Congress Association (ICSA) & University of Calcutta has organized the 100th Indian Science Congress in Kolkata. Techno India Group, as host organizing committee of 100th Session of Indian Science Congress, welcomes all dignitaries & delegates. Pride of India Exhibition will be organized in the Ground adjacent to Salt Lake Stadium, Kolkata on 3rd January 2012 [2pm to 5:30pm] and 4th – 7th January 2013 [9:30am – 1pm and 2pm – 5:30pm]. Children Science Congress Exhibition will be organized at Young Innovators Pavilion, S.N. Bose National Centre for Basic Sciences, Salt Lake (Kolkata) on 4th January [2pm-5pm], 5th January [10am-1pm & 2pm-5pm] and 6th January [10am-1pm]. Plenary Sessions Exhibition will be organized at Bose Pavilion, S.N. Bose National Centre for Basic Sciences, Salt Lake, Kolkata [9am to 10:30am] on these topics – M N Saha Session: Exploration & Energy (4th January), Homi Bhabha Session: Mega Science & India (5th January), N Borlaug Session: Sustainability Science & Climate Change (6th January) and C Subramanian Session: Biodiversity Conservation & Food Security (7th January). Theme Symposiums will be organized at Nano Block, Calcutta University Technology Campus, Salt Lake between 11:15am & 1:15pm. Sectional Committee Meetings will take place between 2pm & 5:30pm at Calcutta University Technology Salt Lake Campus, S.N. Bose National Centre for Basic Sciences Salt Lake, Jadavpur University Salt Lake Campus, All India Institute of Hygiene & Public Health Kolkata. Sessions of Women’s Science Congress will be organized at Eastern Zonal Cultural Centre (EZCC) Salt Lake on 5th January [10am-1:15pm & 2:15pm-6pm] and 6th January [10am-1pm]. Sessions of Vigyan Sancharak Sammelan will take place at Techno India University Campus (Salt Lake) on 4th January [3:15pm-6pm] and 5th January [2pm-5:35pm]. Public Outreach session will be organized at National Institute of Cholera & Enteric Diseases (NICED), Kolkata on 4th January 2013 at 2pm. Don’t forget to pay a visit to ICAR Pavilion at Pride of India Expo (Salt Lake Stadium, Kolkata) between 3rd & 7th January 2013. For further details of 100th Indian Science Congress of Kolkata please visit official website www.isc2013.in / www.dst.gov.in. You all are advised to attend the 100th Indian Science Congress of Kolkata and be a part of 100th Indian Science Congress’s success.